All chapters have been updated to include changes in laws, regulations and practices. Issues in educational and clinical settings are broken into different chapters. * Chapters have been grouped into three sections to improve flow of the text - Personal Practices, Athletic Training Practices and Organizational Practices. * Faculty will have access to an Instructor's Manual, PowerPoint slides, and Test Bank Questions. Updated topics inside the second edition include: * Use of social media. * Multiple generations in the workplace. * Time management and prioritisation. * Process of writing a business plan. * Athletic training as a business. * Starting your own business. * Administrative models in educational settings. * Impact of degree transition in athletic training. * Guidelines for appropriate medical coverage in secondary school and university settings. * Expanding roles of Athletic Trainers in clinical settings. Instructors in educational settings can visit www.efacultylounge.com for additional material to be used for teaching in the classroom. 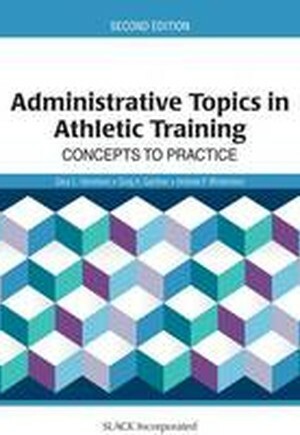 This new edition provides beneficial information on administrative topics and will be a useful resource for athletic training students, practitioners, and any administrator responsible for supervision of athletic trainers and athletic training service programs.